I wanted this review to be, in part, a shout-out to our former colleague and friend Adam (thinking of you, man). Every time in the past a new release from Shadow Kingdom came out Adam wanted to hear it, and we often left it up to a toss-up who will cover a new album. Adam got the dibs on the Sinister Realm eponymous debut and, rightfully so, made that album to be his Surprise of the Month. 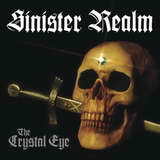 Spearheaded by the songwriting of former Pale Divine bassist John Gaffney and armored by a strong voice of the local Pennsylvania talent Alex Kristof, Sinister Realm continues very much in the same vein with their second full-length The Crystal Eye. The album unifies traditional 80s heavy metal and its doom half-brother. Epic melodic flowing tunes like With Swords Held High reminded me why I flocked to metal music as an emotional youth in the early 80s. Dry, straight to the point Dio-style no frills riffs of Winds of Vengeance and Signal the Earth call on the attack, prodded on by Alex’s voice taking higher notes yet maintaining the, ahem, sinister edge. With a loud snappy bass and spiked up by tasty well placed solos, The Crystal Eye is both a good nostalgic moment for an older dude, like yours truly, or an introduction to what metal used to be for a younger fan. At the same time, songs like Tormentor (Deliver Us) combine the mighty Judas Priest gait and the evil, stab and twist side of Candlemass with its varying tempos. To name Candlemass as the only strong influence point for Sinister Realm, however, would be an obvious but simplistic way to describe their music. The headbanger in Sinister Realm often struggles with a ritualist, trying to isolate himself in its room with a quiet acoustic or an unusual string arrangement. When you expect a crushing brooding doom, based on the title and the first few chords, The Shroud of Misery unveils an incredibly emotional acoustic ballad growing ever stronger with Alex having one of his strongest moments yet. The closer The Tower is Burning raises things another notch in terms of epic grandeur. Without making the mid-Eastern theme sound tired, the band takes you on both caravan and bazaar travels and just plain kills with harmony, ending with a guitar solo flowing into a female soprano voice. To be broader in my harebrained analogies, and especially given the timbre and clarity of Alex Kristof’s voice, The Crystal Eye reminded me a bit of Tad Morose before they leaned way heavily into power metal or, even more closely, of Memory Garden, a less known Swedish melodic doom band. Whatever the comparison, The Crystal Eye was a true hearty pleasure to listen to, something that sounded so comfortingly familiar, yet presented new memorable moments to come to back over and over again. If anything, I personally liked this album more than the debut as it streamlined the songwriting losing some of the “empty” moments from Sinister Realm, the album. Let’s hope the label can hold on to its talented discovery.